The German food business faces considerable changes. As online retail gains ground in the food segment, established retail groups face a challenge that might sooner or later make their market dominance falter. After all, their established competitors are by no means alone in going for the online groceries business. In retrospect, will 2017 one day be seen as a year of sea change in the German food retail sector? In May, Amazon Fresh entered the market as a competitor that might, with its enormous range of products and its outstanding digital and logistical competences, call into question territories that established companies have for years staked out as their own. That is why not only established retail enterprises like Edeka, Rewe, the Schwarz Group, Aldi, and Metro, that between them share nearly three quarters of food retail revenues in Germany, are worried about market shares; small and midrange retailers are also fearful for their survival. In an interview with WirtschaftsWoche magazine Christoph Niering, chairman of the Association of Insolvency Administrators in Germany (VID), warned on the occasion of Amazon Fresh’s market entry that the new delivery service might trigger a wave of bankruptcies in food retail. At first glance, Armageddon scenarios of this kind would seem to be much ado about nothing. After all, according to the Bundesverband E-Commerce und Versandhandel Deutschland (bevh), the German eCommerce and mail order business association, online food retail trade totaled EUR 932 million in 2016. That may sound like a lot, but it is a mere 0.5 per cent or so of food retail revenues totaling EUR 195.5 billion. Yet although online groceries may as yet only account for a relatively small share of the sales total, there has been an enormous amount of activity in the sector for some time, triggered not just by fears of the “specter” of Amazon Fresh. With enormous sales growth rates of 26.7 percent in 2016, for example, according to the bevh, online food retail holds forth the promise of growth that retailers have long ceased to achieve in other areas of business. Gaining a foothold in online retail and playing an active part in shaping the trend confronts companies with considerable challenges. For one, retailers cannot build on their stationary strategies because low margins force them to focus mainly on costs and less on process optimization, which is of fundamental importance in eBusiness. For another, they cannot fall back on other industries’ tried and tested online concepts because the groceries sector differs fundamentally from conventional eCommerce in a number of specifics. These range from strategic issues such as pricing and significant differences in the customer’s shopping experience to logistical challenges such as maintaining the refrigeration chain. The differences between groceries and conventional online business are especially apparent in order processing. 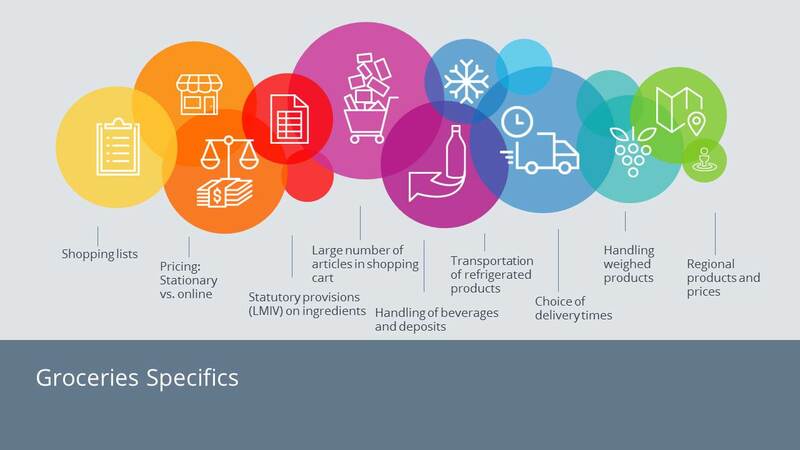 In contrast to ordinary online business, in which changes to an order as a rule merely involve partial shipments or returns, in the groceries sector they tend to be a standard procedure. The reasons for this are many and varied and can occur at any stage of the delivery process to the customer, as exemplified by an order for 400 grams of bananas. A problem at the picking stage could be that the Chiquita bananas ordered are no longer available and the picker has to select the retailer’s own brand as a substitute. That is the first change and it may even affect the order price. In addition the picker may face the problem that Chiquita bananas are sold out and 400-gram packs of own brand bananas are no longer in stock either. So he has to make a further change to the order and select two 250-gram packs, which are still available, in order to come as closely as possible to what the customer wanted. Order changes can also occur in transit. The delivery driver might drop the carrier bag and damage one of the two packs of bananas so badly that it can no longer be handed over to the customer, leading to a third order change. A fourth may follow if the customer refuses to accept the remaining bananas because of a number of black blemishes. To make matters worse, he hands the driver ten PET beverage bottles and an empty crate with a refundable deposit, thereby necessitating a fifth and final change to the original order. This example by no means covers all order change eventualities. The list is almost endless. 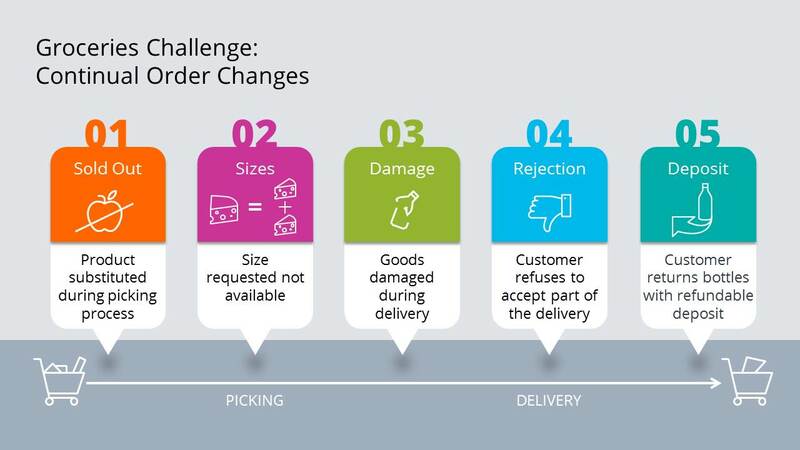 Yet even though these changes may not occur with every delivery, the central requirement of IT in the groceries sector is that it must support processes in online food retail that are clearly more complex than those of conventional eCommerce to the best possible extent and, ideally, optimize them. In this way it can help simplify various sub-aspects of the supply chain and keep the food retailers service promise. IT must provide systems that make order changes simple and fast. IT must keep an eye on everyone who is involved in the supply chain with their specific requirements and provide systems that make order changes simple and fast. When articles are not available the picker could, for example, be notified automatically of any notes the customer has made during the order process – such as whether the picker is to pick substitutes for products that are unavailable and, if so, which alternatives. Is he, for instance, to select organic bananas that may be much dearer than the Chiquitas? Or are Chiquita baby bananas – still in stock – an acceptable alternative? In delivery, speed is of course a key factor. So the driver must be able to enter rejects or deposit items into the system in a matter of seconds to avoid unnecessary delays on the remainder of his tour. IT-assisted process optimization is not, of course, an end in itself to make work easier for employees and thereby to cut the retailer’s costs. Effective processes also help to boost customer acceptance of online food retailing. The delays in delivery mentioned above are a case in point. In selecting a delivery time slot when ordering, the customer expects a timely delivery. Given this expectation, delays can have a devastating effect on the customer’s attitude toward the retailer’s online offering. So IT systems that make swift order changes possible hold the key to reducing this risk to a minimum. In addition, intelligent route planning that takes into account not only the latest traffic information, parking availability and any walking that may have to be done but also specific driver feedback will help to make deliveries friction-free. The ability to offer customers an exciting shopping experience by means of service-oriented processes will decide in years to come which competitors are able to position themselves successfully in the online groceries sector. At the same time, however, retailers must be aware that standards in this competition are set not only by online but also by stationary competitors. Competitors’ offerings will be judged mainly by whether established customer behavior can be meaningfully simulated online, thereby obviating the need to call at the store. Standards in this competition are set especially by the stationary business. Produce sold by weight is a case in point. At a stationary retail outlet the customers are usually able to weigh and buy the quantity of certain kinds of fruit or vegetables such as cherries, bananas or tomatoes that they require. Integrating individual weighing into the picking process is pretty well ruled out by the effort and expense it entails. Instead, retailers normally offer only pre-weighed quantities. So the only option is to simulate the flexibility to which store customers are accustomed by offering a variety of package sizes. While the problem of weighed produce may be partly circumvented in this way, a satisfactory solution has yet to be found for the inability to sensually experience fresh goods at a webshop. Many customers are used to being able to take a close look at fresh produce such as fruit, vegetables and meat in-store before buying it. That is not yet feasible in the online world. Instead, customers are merely able to reject the produce delivered if it fails to meet their expectations. Many customers find that unsatisfactory. These examples show how difficult it is to take into account customary shopping behavior in the groceries sector. Future process optimization may further improve the shopping experience, but it would seem more than likely that certain friction points will persist on a long-term basis. Whether eCommerce can really succeed in taking over food retailing and can do so profitably in the medium to long term will therefore depend to a considerable extent on whether customers are prepared to change their cherished stationary shopping behavior in return for the additional benefits that online food retail offers. Major changes in shopping behavior are not impossible, however, as shown by the clothing sector. A few years ago only a handful of experts expected online business to gain a perceptible sales share. The customer’s wish to try clothing on before buying it was widely seen as an insuperable hurdle. Today, eCommerce accounts for nearly one quarter of fashion sales revenue in Germany, so food retailers should not let themselves be tempted to dismiss the online groceries sector as a line of business with no future. That could prove to be a momentous mistake. Bundesvereinigung der Deutschen Ernährungsindustrie: Ernährungsindustrie.2017, 2017, p.11.